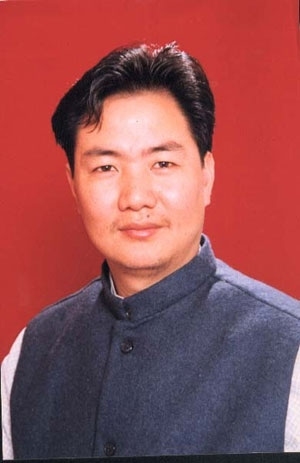 Kiren Rijiju is currently a Member of Parliament (Lok Sabha) representing the Arunachal Pradesh west constituency. He is also a member in the Standing Committee on Energy, the Consultative Committee on Petroleum & Gas and the Consultative Committee, Ministry of Tribal Affairs & Development of North Eastern Region. Prior to his election to the Lok Sabha he was a member in the Khadi and Village Industries Commission, Government of India. Recently Kiren got another feather in his cap when he was selected as a national secretary of the Bharatiya Janata Party (BJP). His selection is the highest such appointment in north east India. He has always been a hardworking, committed and loyal worker of the party and his appointment proves that BJP is a cadre based party and not some hereditary political outfit. Kiren was born on 19 November 1971 and is a resident of Nafra, Arunachal Pradesh (India). He graduated from Hansraj College, New Delhi and following that studied law at the Campus Law Centre, Faculty of Law, University of Delhi. He married Smt. Joram Rina (now Rina Rijiju) in 2004. She is a graduate from Lady Shri Ram College for Women, New Delhi and a gold medalist from Arunachal University and a lecturer in History in Dera Natung Government College, Itanagar. He has widely travelled the globe and has been in most continents of the world except South America and Antartica, and dreams of going there someday. Even as a student he participated in the "Festival of India in USSR" held in Moscow in 1987. He has visited many countries in the middle east, Europe and the US as a member of various Parliamentary delegations.